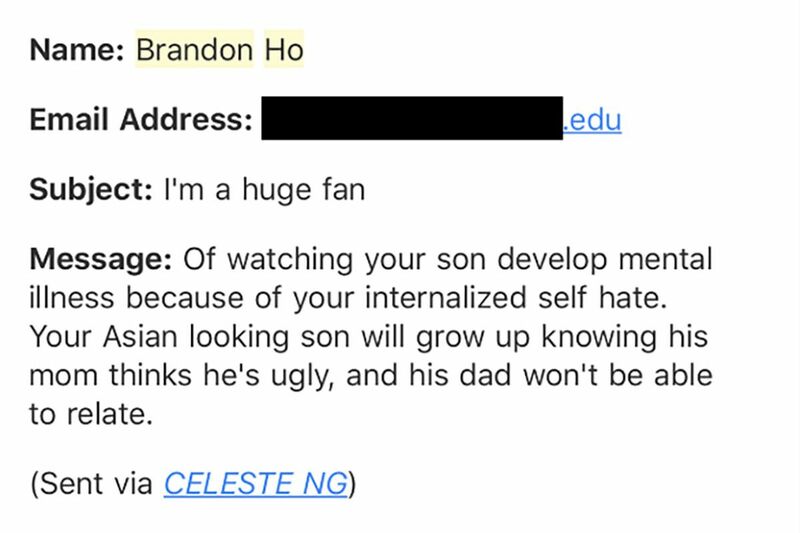 The men who harass me know three things: I’m Chinese-American, my husband is white, and our son is multiracial. You hate Asian men, they insist; you hate your own child. You hate yourself. I once received 27 tweets — calling me everything from “irrelevant” to “liar” to “coward” to “neglectful gaslighting mother” — in 48 hours, from one person. I save these messages in a folder on my computer to document the abuse. Whenever I upgrade my laptop, I copy them over, little packets of poison I must keep and carry forever. This entry was posted	on Sunday, October 14th, 2018 at 00:14Z	and is filed under Articles, Asian Diaspora, Media Archive, United States, Women. You can follow any responses to this entry through the RSS 2.0 feed. Both comments and pings are currently closed.